The Dachshund originated in Germany, and still carries a German name. "Dachs" meaning "badger", and "Hund" meaning "Dog or Hound." As the name implies, the dog was bred for the purpose of entering the tunnel of a badger and entering into mortal combat with an opponent armed with formidable claws and teeth. Dogs built on a higher center of gravity had a harder time dealing with the badger in the confines of the tunnels. They were first imported into America between 1879 and 1885, and appear in the books of the American Kennel Club about that time. Since the days of hunting badgers, Dachshunds have been progressively bred smaller. From the 30 to 40 weight of the badger-fighting breed, they dropped to 16 to 20 pounds, and even smaller since the turn of the century. 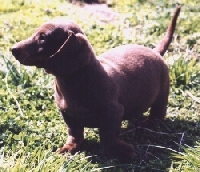 The original dachshunds were brownish-red in color, which led to problems during foxhunts when hunters would shoot their own dogs. The resulting "friendly fire casualties" led to the development of the most popular color today, the black/tan combination. A dappled variant is also common after the breeding in of albino mutations. Also common are single color animals in chocolate and other colors. Brown (officially categorized as Red) is also still common, although not recommended for fox hunters! 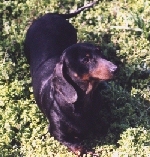 We began raising Dachshunds in 1998 and have really enjoyed the loving affection and personalities of these dogs. They are very affectionate and energetic. They are wonderful with children and are little lap companions. Most of the dogs we breed are short hair coats, but we do have some background in long haired dogs. Currently, we have two stud dogs and five females. Our goal is to continue to add more breeders with the chocolate dapple color. One of our stud dogs (pictured above) is a black/tan/silver dapple. He is very smart, has a wonderful disposition, and has produced nice litters with different colors. He weighs about 12 lbs. Our other male is red in color. All of our dachshunds are out of large litters, and have produced an average of five to seven pups per litter. We remove dewclaws, and keep all of our puppies on a strict vaccination and worming regimen. They are hand-raised and whelped in our outdoor kennel in igloo doghouses. They receive lots of human interaction, and all of our dachshunds have good dispositions and are very affectionate.